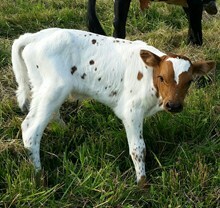 This young black and white Cowboy Chex daughter throws thick, colorful calves. She has a huge udder and supplies plenty of milk. 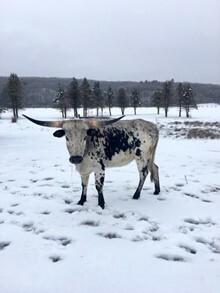 She was re-exposed to CCC Goliath for a hopeful repeat of this years 2018 heifer calf. This girl out produces herself every time. She has a huge utter and large frame. She is an easy keeper that has given us 2 beautiful large framed heifers as her replacements. Time for someone else to enjoy her beauty and offspring. Natural Service JP GRAND MARSHALL 08/04/2015 Over Lynn is pasturing with JP Grand Marshall for a 2016 calf.